Panther seniors Bailey Beckman and Morgan Johnk competed Tuesday at DC-G in search of a spot in the Drake Relays. Sophomore Olivia Steffen of top-ranked Panorama runs at the front of the pack during a relay Tuesday in Van Meter. Photo courtesy Greg Thompson. 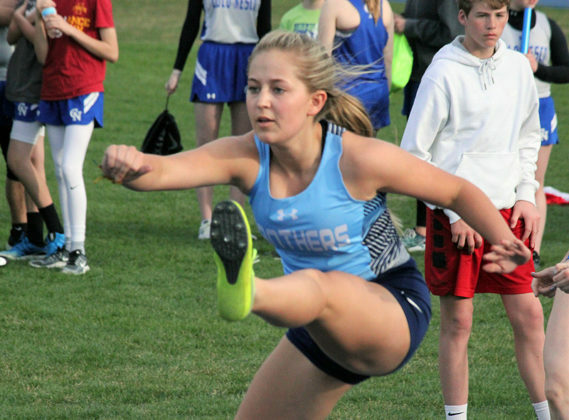 VAN METER — The Class 2A top-ranked Panorama girls track team had little trouble in winning the Van Meter Coed Relays Monday, with the Panther boys placing fourth in a 12-team field. Panorama rolled up 194 points on the girls side, with Carlisle and Van Meter a far-distant second and third at 115.5 and 107.5, respectively, in the 14-team meet. Des Moines Christian’s 151 points won the boys title, with Woodward Academy second at 133.5, Van Meter third at 109 and Panorama fourth at 77. 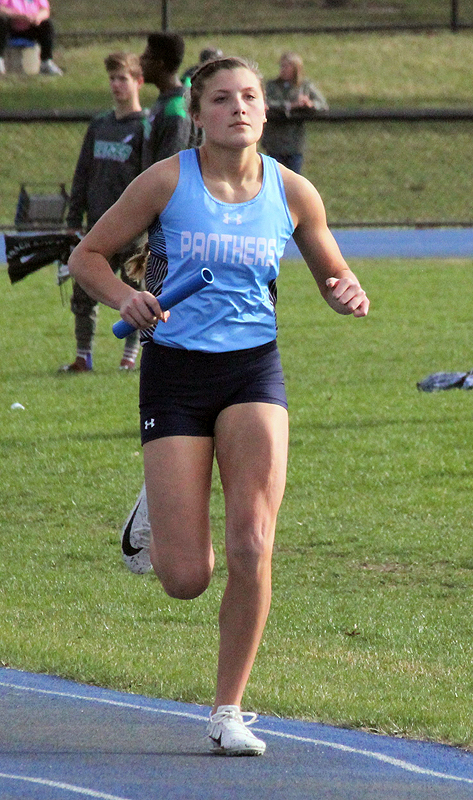 The action took place a day before Panther seniors Bailey Beckman and Morgan Johnk were allowed by host DC-G to participate in a meet in Grimes Tuesday. Beckman shattered her own school record in the long jump by flying 17 feet, 8-1/2 inches topping the mark of 17’3-1/2 she had established earlier this season. Her effort earned an automatic bid the the Drake Relays and ranks her second in 2A. Johnk ran the 100 hurdles, and cleared 5’3-1/4 in the high jump, almost certainly good enough to earn a return trip to the Drake Relays in the event. Both played key roles for Panorama Monday, with Johnk clearing 5’2 for third in the high jump while Kassidy Bremer and Beckman placed 2-3 in the long jump at 16’8 and 16’4-1/2. Lydia Knapp added to the field event points proliferation by winning the discus at 128’5 and finishing second in the shot put at 34’5. Johnk won the 100 hurdles in 15.82 seconds, with Lydia Lindstrom and Shey Storesund 2-3 in the 400 hurdles in 1 minute, 12.08 and 1:12.94, respectively. Ella Waddle was dominant in winning both the 1500 (5:08.6) and 3000 (10:53.14), with Olivia Steffen third in the former in 5:29.9 and Leah Fett fifth in the latter in 13:37.56. Bremer was second in the 100 (13.88) and first in the 200 (27.75), with Abbi Brown fifth in the 200 in 28.95. Gwen Steffen and Angel Poldberg were 3-7 in the 400 in 1:02 and 1:09.79, with Gwen Steffen and Brooklyn Behrends 2-7 in the 800 in 2:31.07 and 2:42.88. 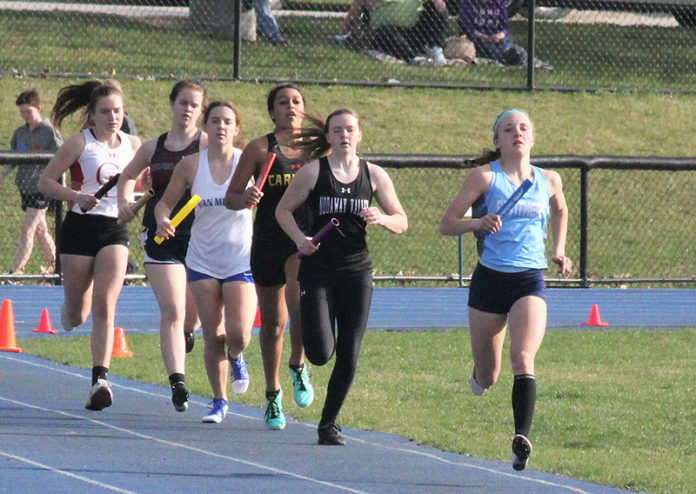 Panorama was second in the 4×400 in 4:14.62 and fifth in the sprint medley in 2:06.42, with Bailey and Payton Beckman, Lindstrom and Gwen Steffen running the former and Behrends, Poldberg, Olivia Steffen and Payton Douglass the latter. The Panthers won the other five relays, with Storesund, Waddle, Payton Beckman and Olivia Steffen claiming the distance medley (4:34.57) with Lindstrom, Payton Beckman and the Steffen twins grabbing first in the 4×800 (10:19.82) while Storesund, Brown, Douglass and Johnk were the first to finish in the shuttle hurdle (1:09.26). Storesund, Brown, Payton Beckman and Hope Arganbright teamed to win the 4×200 in 1:54.11 while Bailey Beckman, Johnk, Arganbright and Bremer sped to first place in the 4×100 in 51.94. The combination of Luke South, Zach Rizzuti, Allias Stahl and Spencer Hunt won the boys sprint medley in 1:42.09 for the Panthers, with South, Logan Hutchins, Levi Richey and Gracen Welberg placing second in the shuttle hurdle in 1:08.85. Stahl, Richey, Hutchins and Dominic Walker were third, in 4:07.47, in the distance medley, with Walker, Rizzuti, Kade Kemble and Kevin Cogil seventh in the 4×800 in 9:44.25. Stahl, Walker, Dillon Bennett and Preston Prince ran the 4×200 in 1:50.74 while Richey, Walker, Cogil and Kemble ran the 4×400 in 4:14.61. Welberg won the high jump with a leap of 6 feet, with Rizzuti eighth in the long jump at 18’1. Koltin Sloss used a spin of 117’3 to place third in the discus, with his throw of 39’9-1/2 placing eighth in the shot put. Hunt was second in the 200 (23.65) and third in the 100 (11.77), with Cogil third in the 800 (2:12.29) while Welberg was fourth in the 400 (57.01). South crossed second in the 110 high hurdles in 15.79, with Hutchins finishing the 400 low hurdles in 1:06.36 while Avery Norman posted a 5:49.69 in the 1600. 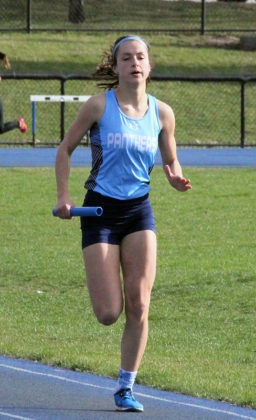 The Panther girls will visit Underwood Thursday in a meet not on their original schedule. Both Panorama teams will compete at Audubon Tuesday and at AC/GC April 25. Panorama's Payton Douglass flies down the lane on her leg of the shuttle hurdle in Van Meter Tuesday. Photo courtesy Greg Thompson. Lydia Lindstrom carries the baton for Panorama at Van Meter Tuesday. Photo courtesy Greg Thompson. Freshman Payton Beckman runs out in front Tuesday during Panorama's winning effort at Van Meter. Photo courtesy Greg Thompson.